Your dishwasher works so hard every day! Not only does it make cleaning up after dinner a breeze, but it also helps keep your family’s dishes and silverware clean and disinfected. Cleaning an appliance whose job it is to clean your dishes may seem counterintuitive but cleaning your dishwasher on occasion is definitely necessary. Over time, your dishwasher can become filled with bits of food, grease, and soap scum. All of this dirt and grime can get stuck in the various nooks and crannies of your dishwasher, which can not only make it smell bad, but it can also make it run less efficiently. 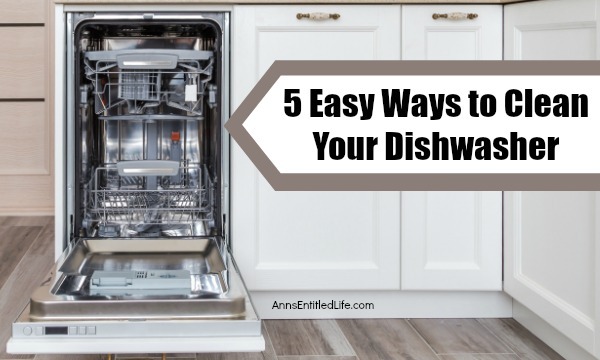 Luckily, there are a variety of simple ways to clean your dishwasher. 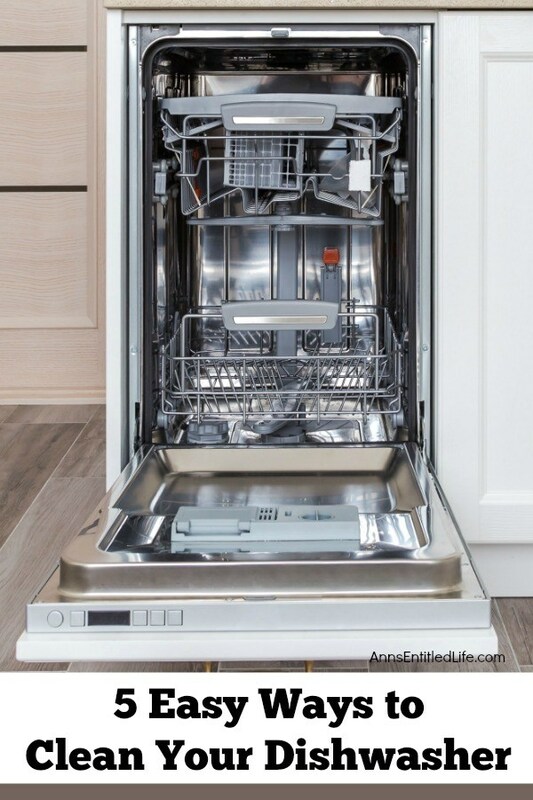 Whether you are searching for an easy, natural option or a lesson on deep cleaning this essential appliance, I have you covered. These five easy ways to clean your dishwasher will have your beloved kitchen appliance sparkling fresh in no time. Note: read your dishwasher manual before you do any of the listed ideas below. I have recommended some cleaning supplies that shouldn’t harm your dishwasher, but read the manual to make certain they are not on the no-no list. You never know what may clog your dishwasher, interfere with the traps, or harm the dishwasher finish. So, before you begin, read the manual as it is better to be safe than sorry! Before we begin I want to point out that there may be catch-screens in your dishwasher. While reading the manual, check to see where they are, and if they are removable. For instance, on my Miele machine, I have several traps and strainers, and one that should be removed and rinsed off weekly. It catches all the stray food particles. It will form a build-up of detergent too. I make sure I remove that particular screen and clean it with a scrub brush, and soap and water weekly so it will not smell or accumulate food. A deeper clean is done monthly. When cleaning the sides of your dishwasher door, you may want to lay down a towel or paper towels on your floor to catch drips and falling debris. One of the easiest ways to clean your dishwasher is to use baking soda and vinegar. In addition to being one of the most natural ways to keep your dishwasher clean, it is also the most cost-effective – both baking soda and vinegar are very inexpensive ingredients. This two-step cleaning process will instantly make your dishwasher sparkle and help to naturally disinfect the appliance. To start cleaning your dishwasher with baking soda and vinegar, scan the bottom of your dishwasher and the drain for any large chunks of food or debris that could cause damage to your dishwasher or result in a clogged drain (see screen note above). After you have removed the debris, place a dishwasher-safe cup or bowl in the top rack of your dishwasher and fill it with white vinegar. Run your dishwasher on the hottest water setting with no other dishes inside (aside from the vinegar filled cup). This vinegar cycle will help loosen any other stuck-on debris inside your dishwasher, as well as work to disinfect and deodorize the inside of the appliance (since vinegar is a natural disinfectant). When the vinegar cycle has finished, it is time to wash your dishwasher with baking soda. To start the final step in this cleaning process, sprinkle a handful of baking soda all around the bottom of the dishwasher. Then, run another short cycle using hot water to rinse away the baking soda, along with any remaining debris that may be lying in the bottom of the dishwasher. This baking soda cycle will help remove any lingering odors and clear away food stains from inside your dishwasher. Pine-Sol is great for mopping your floors and it is also amazing for cleaning your dishwasher. While other cleaners, like vinegar or a bleach solution, for example, are perfect for disinfecting your dishwasher, they are not so great at cutting through the grease and grime that can overtake the appliance. Although it is tempting to avoid adding dishes that are greasy to your dishwasher by cleaning grimy dishes before putting them in the rack, it’s actually better for your dishwasher to incorporate some grease into each cycle. Without it, the dish soap may bubble up more than usual, causing your machine to run less efficiently. This means that grease buildup in your dishwasher is inevitable. And one of the best ways to cut through this grime is by spraying a Pine-Sol and water solution inside your machine to easily wash away the grease. Simply spray your Pine-Sol solution on the interior walls, bottom, and door and wipe away with a damp cloth. In addition to cleaning the grime from your dishwasher, Pine Sol will also leave it smelling fresh and clean for days. Borax is another cleaning solution that is great for scrubbing your dishwasher. Borox is a naturally occurring mineral that can quickly and inexpensively clean your dishwasher. Start by wetting a sponge and sprinkling Borax all over it. Then use the Borax-covered sponge to scrub the inside of the dishwasher door, bottom floor, and side walls. Be sure to work your sponge into all your dishwasher’s nooks and crannies to remove any stuck-on debris that may be hiding. Finally, rinse the Borax from the sponge and run the damp sponge along the inside of the dishwasher to rinse the cleaning solution away. Also, be sure to wipe away any debris that may have come lose as you were scrubbing. Using Borax in your dishwasher as you run your dish cycles may also be beneficial. In addition to providing a boost to the cleaning power of your dishwashing solution, it will also help keep your dishwasher fresh and clean in between cleanings. Simply sprinkle a handful of Borax powder along the bottom floor of your dishwasher each time you run a load of dishes to freshen your dishwasher and make your dishes sparkle. We all loved this sugary drink as a kid, but did you know you can use Kool-Aid to clean your dishwasher? The trick is to choose the unsweetened lemonade version of this drink powder, which contains citric acid. The acid will help lift away unsightly stains inside your dishwasher and make the appliance smell lemon fresh when it’s finished doing its job. Start by emptying the dishwasher of all the dishes (you can keep the racks and utensil tray inside) to ensure the lemonade spreads throughout the entire machine. Then, fill the detergent slot with a single packet of lemonade Kool-Aid, close the lid, and run your dishwasher on the hottest setting possible. When the cycle is finished, your dishwasher should be clean of stains and smelling fresh. If you still notice some stubborn rust stains or mineral deposits along the inside walls of your dishwasher, remove the racks and wipe the stains with a wet sponge or washcloth. The stains will easily wipe away, leaving a fresh and clean dishwasher to enjoy. If all of these dishwasher cleaning ideas haven’t gotten your dishwasher as clean as you would like it to be, it may be time to do a deep cleaning of your appliance. To start, completely empty your dishwasher of all the racks, trays, and baskets so you can easily access the bottom parts of the appliance. First, check the spinning arms to ensure each of the holes are clear of debris so water can easily spray freely from the arm. If you notice debris in any of the holes, use a toothpick or soft toothbrush to loosen the gunk and wipe the arm clean with a damp paper towel or sponge. Next, it is time to check the dishwasher’s drain for food chunks and other debris that can cause clogs. The drainage area typically features a grate around it and is located under the dishwasher’s arm. Loosen any stuck-on debris with a toothbrush covered in baking soda and wipe the debris away with a wet cloth. Then take a toothbrush and scrub along the bottom of the dishwasher door and along the sides and edges of the appliance. It is also a good idea to check your dish washer’s utensil holder and dish trays for food pieces and wash them with warm, soapy water. Finish your deep cleaning by spraying along the interior walls and door with a bleach solution and wiping the inside of the appliance clean before replacing the basket and trays. Do you have any ips on how to easily clean your dishwasher? • 15 DIY cleaning formulas to make yourself and use in your home – Homemade cleaning formulas are some of the easiest “recipes” you will ever make! Many DIY cleaning formulas work as well, or better than, commercially made cleaning products. Here are some homemade cleaning products for the kitchen, bath – the entire home! • How to Clean Your Front Load Washing Machine– Front load washing machines are a great way to get your clothes clean, while also saving energy and water. But one major problem many high-efficiency washer owners find is that they can quickly start to smell if not properly maintained. Luckily, there are a few simple measures you can take to avoid those nasty smells and ensure your clothes stay fresh and clean every time you wash. Learn how to clean your front load washing machine and keep it fresh and sweet smelling! • 10 Tips For Hiring a House Cleaning Service – I have had a cleaning service for well over 10 years now, both at home in New York and in our other residences in Utah and Florida. I’ve learned a lot about the dos and don’ts of hiring a cleaning service, and what to expect once you have hired one. These are my tips on what you should know and consider before hiring someone to clean your home!